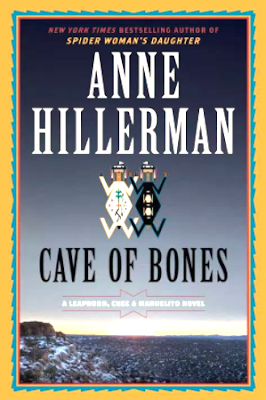 Anne Hillerman’s fourth novel, Cave of Bones, was released in April 2018, and quickly became a New York Times bestseller. She is an award-winning novelist and the daughter of famed writer, Tony Hillerman. GERALD HAUSMAN: When, and why, did you begin to write novels? ANNE HILLERMAN: I began after Tony Hillerman died, probably toward the end of 2009, because I missed both my father and his great stories and characters. GERALD HAUSMAN: How difficult was it to switch from journalistic writing to pure fiction? 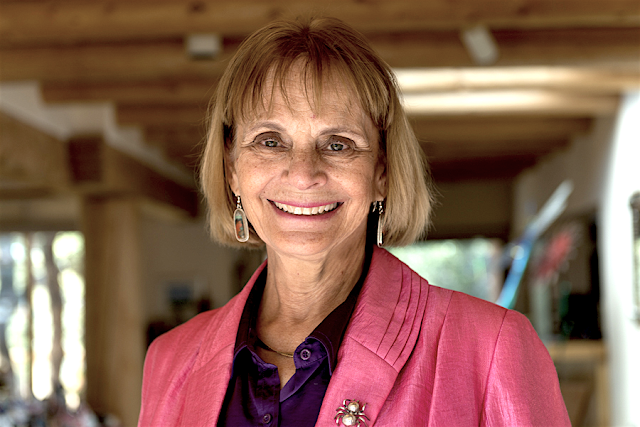 ANNE HILLERMAN: The hardest thing for me was envisioning a longer, more complicated story than I was used to and plotting to create a mystery where clues revealed themselves at the proper pace. The characters and dialogue were easier. I think they grew naturally from my long-time exposure to a variety of people in a variety of situations. GERALD HAUSMAN: Is there such a thing as pure fiction? ANNE HILLERMAN: I don’t think so. If characters and situations spring from real life, perhaps twisty or idealized, but close enough to something seen, experienced or imagined, then readers can relate. Otherwise, there’s no attraction to the story. GERALD HAUSMAN: When did you feel that you were comfortable continuing, in a sense, the “Hillerman” brand of novel? ANNE HILLERMAN: I was pleased with my first novel, Spider Woman’s Daughter, after my editors and I thrashed out a score of changes that made it better and taught me a lot about the art of writing mysteries. I was more comfortable as a novelist when that book won the Western Writers of American Spur Award as best first novel of the year. But I wouldn’t say I’m “comfortable.” Each book challenges me, and I enjoy pushing my self-imposed limitations. GERALD HAUSMAN: What things do you do from a feminine perspective that your father might not have done? ANNE HILLERMAN: My books focus more on relationships – crucial to police work – as a way to deepen the suspense and mystery. That may be a gender issue, although many male writers do this very well. There are other differences but not so much connected to gender as to the changes in technology that make the Navajo world less isolated than back in the 1970s when Dad started the series. GERALD HAUSMAN: What is most liberating about being a fiction writer? ANNE HILLERMAN: Fiction offers so many options. You can change course in midstream if you do it carefully. This is harder to do with nonfiction. GERALD HAUSMAN: Tony once said that he often forgot, in the writing, what color shirt a man was wearing when he entered a room. He added that he sometimes got roads wrong, simply forgetting some detail of direction. Does this ever happen to you? ANNE HILLERMAN: Yep, it happens all the time. That’s why I am grateful for good copy editors and early readers who try to keep me straight. Even with that, dumb mistakes creep in. I won’t embarrass myself further by repeating them here. GERALD HAUSMAN: As far as being a writer, what is the chalice, the highest thing you might wish to reach for? ANNE HILLERMAN: Nothing highfalutin. I want each book to be better than the last, more tightly written, more irresistible, more memorable, more creative. GERALD HAUSMAN: Do you ever feel that it would be possible to switch from writing altogether, and go into yet another art form? ANNE HILLERMAN: Sure, but not as a profession. I’d like to know more about music, do more singing, get back to the piano, try my hand at photography and learn how to draw. GERALD HAUSMAN: Have you ever received “angry mail” where an antagonistic reader doesn’t like what you’ve done in a certain novel? ANNE HILLERMAN: Yes, but it’s rare. Most of the complaints I get are thoughtful, polite and spot on. My readers know more about a lot of things than I do and I appreciate their sharing that knowledge with me, and tactfully pointing out my mistakes. Most angry criticism has come from people so offended I would attempt to write about Tony’s characters that they don’t bother to actually read my books. Grrrrrr. That bugs me. GERALD HAUSMAN: What is the nicest email or snail mail you ever received re: your novels or nonfiction? ANNE HILLERMAN: After my Dad died, I got a lovely letter from a woman who had shined his shoes at the Albuquerque Airport when he was on his way flying here and there on book tours. She said that when she worked up the courage to tell him she was a fan, he took her to the bookstore there, bought a copy of his book The Great Taos Bank Robbery for her and signed it with a personal message. I was deeply missing my Dad at the time, and it made me feel strangely comforted to be reminded of his generosity and kindness by a total stranger. GERALD HAUSMAN: Do you ever feel your dad is looking over your shoulder? ANNE HILLERMAN: Yes, I do in a loving, non-judgmental way as a spirit of encouragement. He tells me to enjoy the process and have fun with it. I try to listen.